Tarte’s Health Couture 2007 fall collection continues to move me. 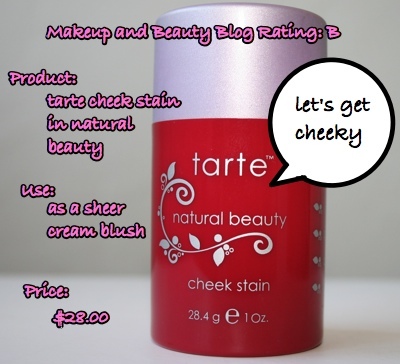 While the ready-to-wear/prêt-a-porter palette appeals to the makeup addict in me, easy-to-use products like Cheek Stain in Natural Beauty really speak to my inner lazy bum. It looks natural, doesn’t feel heavy and took less than ten minutes. 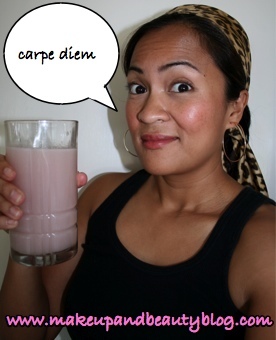 Viva la lazy, ya’ll. So what’s worth bringing home this fall from Tarte’s Health Couture 2007 releases? 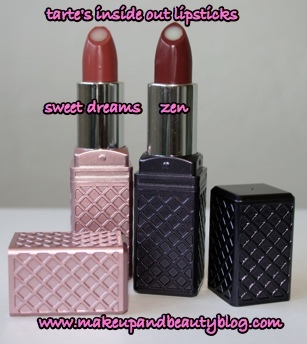 Don’t miss out on the Cheek Stain and the Inside Out Lipsticks! This “no skill required” gel is what put Tarte on the makeup map, and has won awards from magazines like InStyle, Cosmo and Self. Natural Beauty indeed gives a natural looking flush! This red–toned blush has a dewy look on cheeks and has no glitter. I apply just a lil’ bit of it with my fingers and I look like I was just at the gym working on my fitness. Good consistency (not to thick or oily) and smell (oranges) too. Although I like the color, I have to be a careful with the amount that I put on. The color is bright and has a lot of pigment for a gel blush, so if I accidentally put too much on I look like a crazy old lady who can’t lay off the rouge. Also, I wish the staying power was longer. I have oily skin, and after a few hours the blush seems to slide right off. A lovely color that would be good for ladies or makeup loving gents who want an easy, natural cheek look. Apply sparingly or risk Bozo the Clown mega-status. Use: As a matte lipstick. The BORBA powdered drink is supposed to clarify your skin. At first glance, I though that the clear center in this lipstick would give it a sheer look. The colors, like the natural beauty gel blush, are also highly pigmented. Both colors have a semi-matte texture, and are easy to apply. I didn’t use a lip brush and just slapped a layer on directly from the tube with very little effort, yet the look was still relaxed but refined. 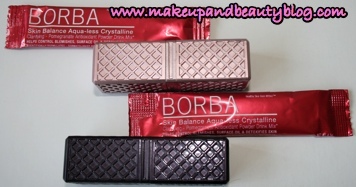 The accompanying pack of “Skin Balance Aqua-less Crystalline” by BORBA is a clarifying pomegranate antioxiant powder drink that’s supposed to help control blemishes, surface oil and detoxify skin. Control blemishes? Sign me up. 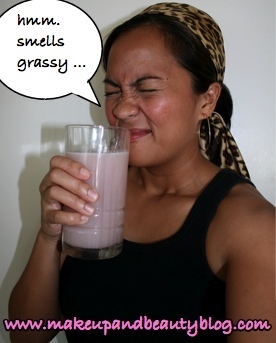 I’ve got a hyper-sensitive sense of smell, and this drink smelled really “grassy” to me. It made my tummy churn. It’s got zero calories, which I suppose is good, and it tasted like a mystery drink with no distinct fruit flavor or sugar. I can’t say if it helped clear my skin. 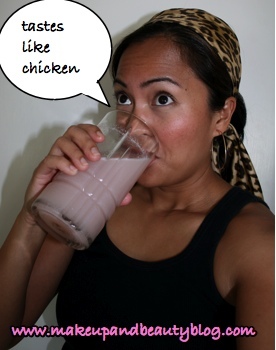 I’ll just stick to drinking obscene amounts of water, which has always helped me to keep the zits away. 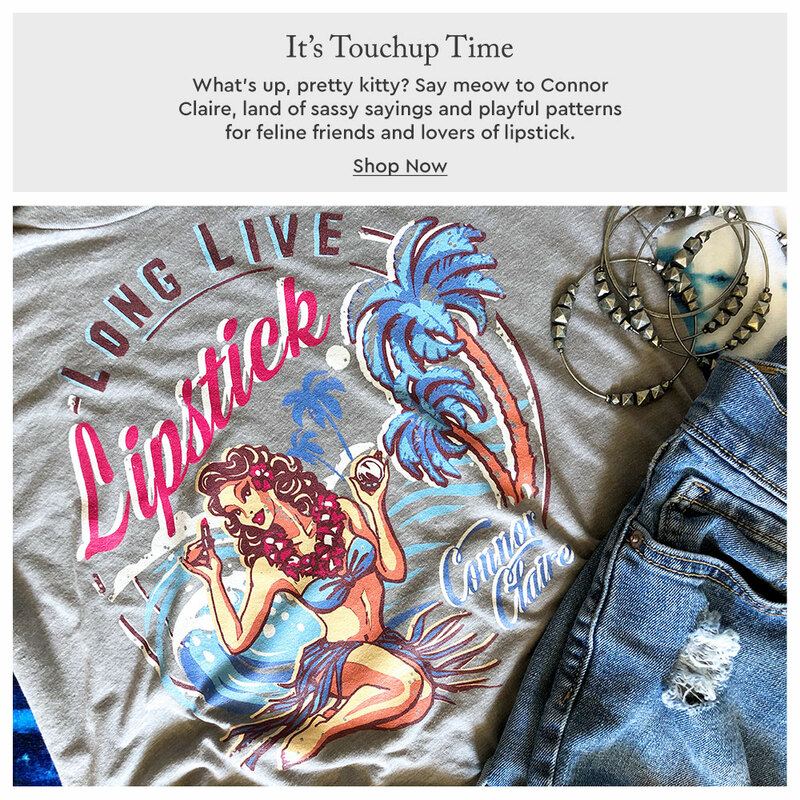 I won’t be downing any BORBA powdered drinks anytime soon, but I’ll definitely be toting this lipstick on my days when I don’t want to put in a lot of makeup effort. Sweet Dreams was my favorite natural-looking color out of the two. If you already have thick and abundant lashes then you’ll dig 4-in-1 mascara because it gives lash emphasis without looking too over-the-top, and holds a lash curl well. Rejuvelash is an interesting product that comes with this set. It’s a clear gloss that you put on later on in the day to revive your lashes. I liked that it was glossy and de-clumped my late-day lashes. 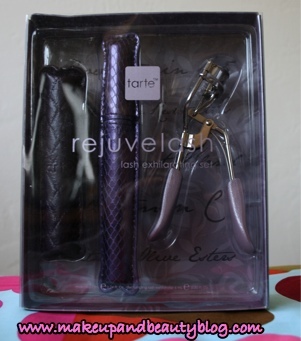 I really wanted to fall in love with this curler, just â€˜cause it has those cute “ergonomic” purple handles. However, I felt like the width of the lash curl area should be slightly bigger because it kept pinching me. Ouch! I compared it to my MAC curler, which is slightly longer by just a touch, but that little bit of room prevents me from getting pinched lashes. Even on my minimal makeup days I like my lashes to look big and flashy, and I had to use a lot of the 4-in-1 to get them to the thickness and length that I like. I used four coats in this picture, lol. That said, even though it built up nicely I wish I didn’t have to put in so much effort to get there. Natural lash beauties will like 4-in-1 mascara. I will stick to my MAC curler, but if you’ve always hated having to put your fingers through the looks of your mascara curler, then Tarte’s version is worth at least a try. Rejuvelash is a neat gloss that busy makeup lovers will like to give late day lashes an instant lift. Have a kickin’ day and I hope it goes by fast! Ohh, cheek stain! I always think about those things, but then staying power… sigh. It’s kind of like how I avoid cream blushes, too. Ahh, I love reading your blog during Criminal Law, it really brightens up my Monday! Yeah, it’s great in theory but not always so much in practice. I’ve tried it with a heavier face cream underneath and it does make a difference in staying power! I never really liked cream blushes when I was younger but lately I’ve found that I can wear them more. I’ve used both Paula Dorf’s and Laura Mercier’s and they both last for a really long time. And aren’t you cute reading beauty blogs in class!!! My, how the time’s have a changed. I remember when all you could do to pass the time was click your four-colored pen to death. I’ll have to check out their lines of cream blushes, though I’ve hardly tried but one or two of MAC’s at this point. Thank god for internet during class! I’d be a goner without it. Especially in Civil Procedure, YAWN. Wow, you young folks are amazing multi-taskers. I can barely handle IM and browsing at the same time. And if the phone rings it’s all over. I’ve never tried MAC’s cream blushes. Are those the ones you have probs with staying power? The cool thing about creams is that they are so handy when you are in a hurry or are traveling. I like to layer them with other powder blushes and highlighters, like the Beauty Powders (LOVE THOSE) from Barbie Lurves MAC. Haha, I get easily distracted if I’m NOT multi-tasking. I look for things to distract me or I’ll zone out usually if I just focus on school work. I’ve only tried the MAC cream blushes in the store, because I’ve never loved any enough to bring them home. I’m such a powder girl, I guess. I assume if you set them with some powder they’ll stay better than without. I like the Beauty Powders, but I’ve always ended up trading them away! I suppose Pearl Sunshine would been really nice to have this summer, damn. Pearl Sunshine is awesome. I sort of forgot that I had it this summer and only used it a few times, oops! your little comic strip is so awesome! lol how cute! reading comments are blogs in themselves..
christine, it’s so interesting hearing about the classes that you take. i work in a courtroom hearing civil trials and matters. hearing it as a job, i’ve never felt interested in learning law, maybe because i’m turned off by litigation mainly. Anyway I have to put those cream blushes on my wish list. I haven’t tried MAC ones yet but I’m sure it’s just an envitable gateway into more MAC obsession. If *only* I looked like that in the morning, LOLOL! I wish! It’s pretty scary before coffee, let me tell ya. Haved you used any tarte products before? And how is your week so far? LOVE the Tarte (3?) 4-in-one Mascara, can’t wait to try the Rejuvelash. I am lash obsessed. Get there. As far as eyelash curlers go, I am completely faithful to my Japanese brands: Shu Uemura and Shiseido. For some reason, they give the most natural looking curl to my lashes and the tension is just right. I started with the Shiseido back in 1996 and switched to Shu Uemura maybe four years ago…and never looked back. Heya BernaDIVA, I haven’t tried either of those brands but I’m curious about the SHU because it’s so hyped up. How do you use it? Do you just pop your lashes in and then press down, or do you have some sorta special method? BTW, I combined the tarte 4-in-1 today with L’Oreal Voluminous Carbon Black and the result was so fantastic. Oh yes….believe the hype about the Shu Uemura curler! No super special technique required, just use as normal (crimp at the base, and then do gentle crimps all the way down your lashes, so you end up with a beautiful curled lash). PS: I know it’s usually advised against, but I also like to do a quick, light curling again after my mascara is dry since my lashes don’t like to curl. But the Shu Uemura curler, paired with the right mascara, does a beautiful job. I DO THAT TOO! I know it’s considered faux pas but my lashes don’t like to curl either. 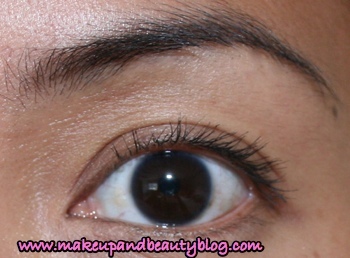 Have you noticed that certain mascaras do a better job holding the curl than others? MAX Factor 2000 Calorie does the trick for me…and lately I’ve been into layering different types of mascaras. What mascaras do you like/don’t like? aww thanks! i haven’t tried any mally products yet although i have to admit i’ve been tempted after watching her on tv. i like her style – fresh, glowy, and just pretty. 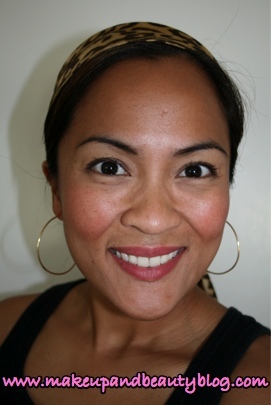 i have a couple of her products on my makeup “wish list”! You know, I’ve seen that Borba drink at Sephora and every time I think about trying it. I remember reading that Eva Longoria drinks the green one (can’t remember the name) and she has such gorgeous skin. I’m sure with something like that, you have to drink it everyday to make a difference, similar to supplements and vitamins. I just love your quirky informative blogging style. It’s so entertaining. I just stopped by your blog today…I love the new banner! Super cute! You know, you might want to try the Borba drink just to get your curiosity fix on. It didn’t taste *bad*, but it didn’t taste *good*, either. If you try the green one lemme know what you think. Being addicted to China Glaze is never a bad thing. Ha!